Many mobile subscribers across India were sent into a panic after receiving a mysterious SMS claiming the end of voice services in the country. 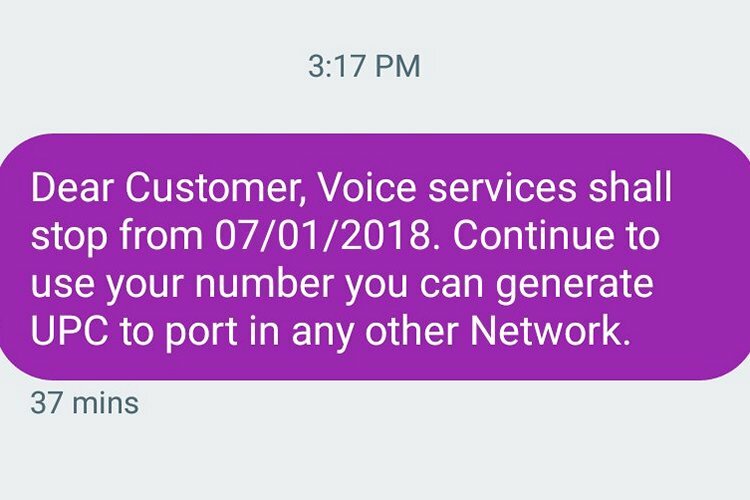 The SMS, which says, “Dear customer, Voice services shall stop from 07/01/2018. Continue to use your number you can generate UPC to port in any other Network”, has apparently been received by a large number of Airtel, Idea, Vodafone and Jio users around the country. Now, before anybody starts reaching for the customer care numbers of their respective carriers in a state of panic, let us clarify that all the aforementioned companies have either categorically stated that the message is fake, or have reiterated their commitment towards carrying on with their voice services as usual. India Today is reporting that the largest telecom operator in the country, Airtel, has already clarified that they are not sending any such SMSes to their customers. Jio, on its part, says that it is investigating the matter, but denies that voice services are on the chopping block. According to a Jio spokesperson quoted by the publication, “Voice calls on Jio are free for life”. Vodafone has also released a statement calling the message ‘spam’. Replying to a query on Twitter, the company said, “This is a spam msg and has not been sent by Vodafone. We request you to ignore this msg & we assure you of continued uninterrupted services”. Idea also took to Twitter complaints to officially clarify its stance. The company not only asks its users “ignore the message” but is actually marketing the new Nirvana postpaid plans. So yeah, Idea is certainly not shutting down voice calling. Sorry for trouble caused to you,We request you to please kindly ignore the message. We have launched new postpaid plans (Nirvana) for our valuable customers.Write us back for further clarification. While it is indeed reassuring to get the clarifications straight from the service provider, a clever user would have seen it as obvious spam. That’s because, even in the highly improbable scenario of carriers actually turning off voice services in the country, they won’t all send the exact same message en masse. And certainly not one so poorly constructed and with bad punctuation. So, there. Myth debunked. Voice calling lives on. Donald Trump will still haunt Twitter at 3 am. The sun will still rise tomorrow. And the Indian cricket team will still lose in South Africa. Perhaps we took that too far. Let us know if you too saw this message and what your reaction was.